So much has changed - it’s been a busy year. I just bought a new home - moving in sometime around November 2010 - yay! Nancy Drew stopped making themes for my BlackBerry Curve in September. I’ve been using one of her last few themes since early this summer. I will get around to posting about it eventually. What a change! When I first started playing HKO, it was run by Sanrio digital. Now it has been split up. The North America version is run by Aeria Games. There are other versions, see this thread by shesroyaltee for all the details. I am currently playing the NA and the EU version of HKO, mainly the NA one. Speaking of which, the more active members of Sailoria/Sailor Scouts have created a new guild called AllStar Scouts. The link to the new forum thread is on the right. 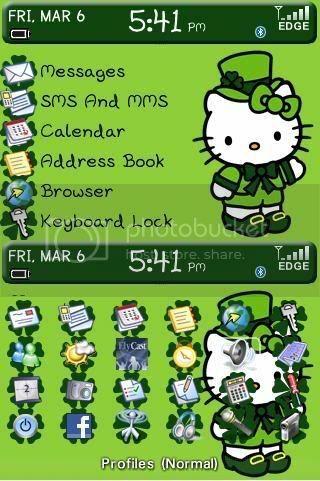 BB Themes Review: Hello St Pattys! Just in time for St Patrick’s Day. It’s a nice theme - everything looks like it complements each other nicely. The greens are a nice shade. Font is readable. The animation of the icons on the home screen make me smile. It’s definitely a theme I would use for St Patrick’s Day - I don’t think I will be using it on another occasion. 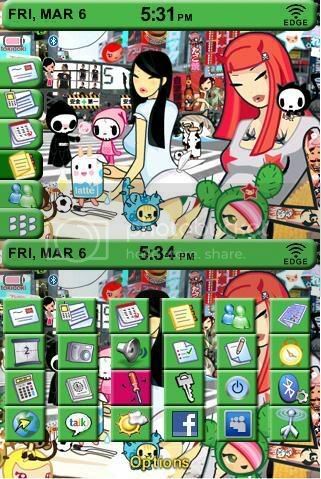 BB Themes Review: Green Tokidoki! I was excited for a Tokidoki theme - however once I got this onto my Blackberry, I wasn’t quite as enthused. Don’t get me wrong. It’s a nice theme but it didn’t give me the “must always use” feel that I get from other themes like the Hello Starbux or the Hello Mac Makeup. The first 5 icons on the home screen is customizable. If you notice, Nancy made the battery indicator look like it was part of the background. I do love the shade of green chosen, not too dark and not too bright. I like the way there is a green square behind each icon - it makes the stock icons and the applications look consistent. 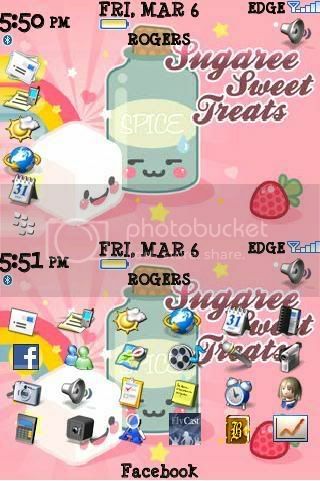 BB Themes Review: Sugar and Spice! This is a better theme than her first that I reviewed - Chococat 4.5 zen. The most important feature for this theme is that the font is readable. The stock icons and the applications look nice together. The wallpaper is very cute.